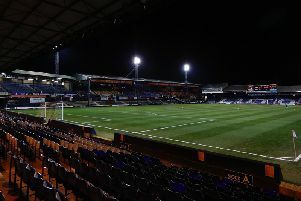 Hatters boss Nathan Jones admitted winning in stoppage time last night at Oxford United was the best way to end his side's long search for an away victory. The visitors looked like they were destined to make it nine games without victory on the road, a run stretching back to last season, missing a hatful of chances as the game went into eight minutes of stoppage time. But after Dan Potts had one goal disallowed, he rose again in the final seconds to nod home Alan Sheehan’s free kick and give Town three points on their travels for the first time since April 7 against Yeovil last season. Jones said: “It’s about time, it’s been a long time coming and I want to say something, these are not in good form and are not getting results, but that’s the first time they’ve been really, I think, turned over. “I’ve watched the games, I know Karl (Robinson) and his staff are under a bit of pressure but they’ve been playing well. “They went to AFC Wimbledon at the weekend, dominated the game, just couldn’t score, I watched them play Walsall and it was an even game. “They’re a good side, but it was brilliant, what a way, the fans were wonderful again. There was no question that despite the lateness of the winner that Town didn’t deserve to emerge triumphant, as they looked head and shoulders above their woeful hosts. Jones added: “I thought we were as dominant as an away side could possibly be first half, I thought we were excellent. "Again, just a little bit of our shooting boots, chances, opportunities, possession, to be fair to them, they gave us massive respect. "They matched us up, played a diamond, they haven't done that, I can't remember Karl Robinson doing that, but I thought we were excellent. "Second half we started slowly, well, we didn't actually, it was a bit of quality from Ricky Holmes. "We'd be disappointed we didn't deal with him, but he showed a great bit of composure. "Then we came at them and it doesn't flatter us in any way. "I keep saying it's a theme and we keep missing chances, as we had enough chances there to have won far more comfortably, but it's a great way to win."